I've owned a number of HP laptops now, and this is the first one that has caused any headache. The laptop comes with 8G ram in a single chip but has 2 slots, using dmidecode you can find the model number to get the same chip again, the chip used is marketed as having low power usage. You could get any compatible ram but i prefer to keep the same models. 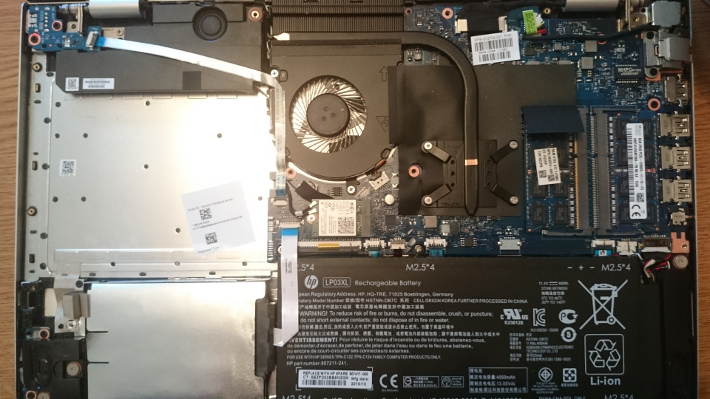 I removed the original harddisk which is a 1Tb hybrid drive, and swapped it out for a samsung evo ssd. It's a good idea to keep the original disk around as hp only provide BIOS updates via windows exe's despite having usb images. To open the odd chasis, unscrew all the screws on the bottom and pry from the back where the monitor joins. There is a youtube video that shows how to open this model, worth a check, but you don't need to remove the battery to remove the harddisk. I grabbed the firmware from wireless.wiki.kernel.org. I had the same issues with wifi as sound regarding powersaving, disabling the powersaving makes the wireless work flawlessly, tested on both 2.4Ghz and 5Ghz. I upped the kernel and compiled it with amdgpu, this is the latest open source kernel driver for the apu. 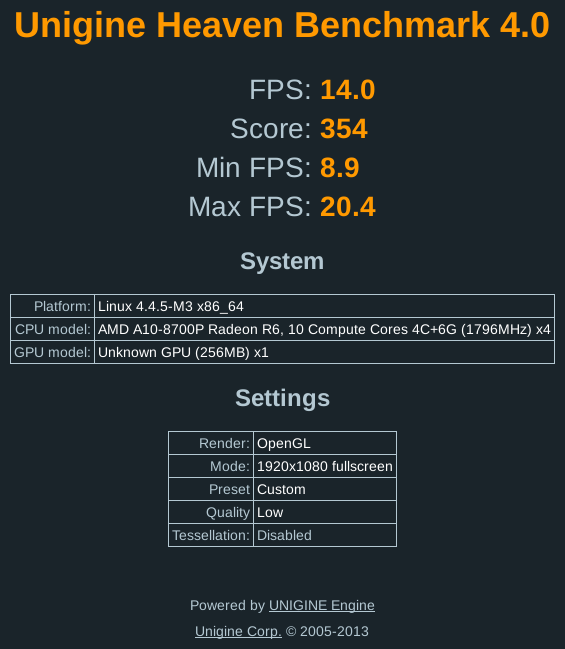 I think the apu is too new for the proprietary driver flgrx but I've not tested this... With this driver the cpu shows little to no additional load when running glxgears / Unigine_Heaven-4.0 (a quick test to see you are processing the graphics with apu/gpu rather than the cpu), the refresh rate is synced, you can check this with glxgears to see you get a refresh rate the same as your monitor, 60Ghz 60 FPS. CONFIG_EXTRA_FIRMWARE="amdgpu/carrizo_ce.bin amdgpu/carrizo_me.bin amdgpu/carrizo_mec2.bin amdgpu/carrizo_mec.bin amdgpu/carrizo_pfp.bin amdgpu/carrizo_rlc.bin amdgpu/carrizo_sdma1.bin amdgpu/carrizo_sdma.bin amdgpu/carrizo_uvd.bin amdgpu/carrizo_vce.bin"
The firmware ucode is availbile in debian package "firmware-amd-graphics". 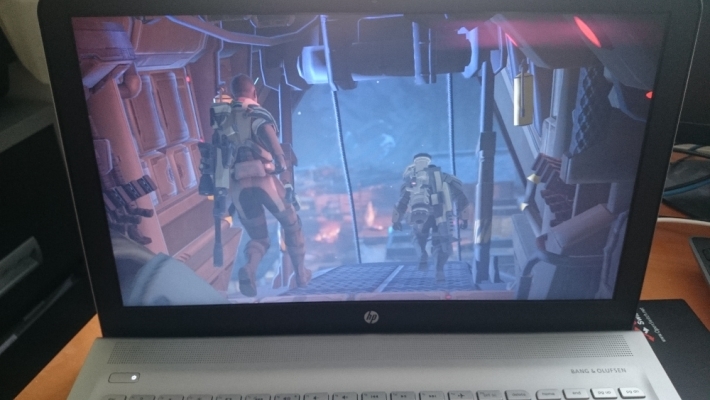 I've tested the cpu in action with XCOM: Enemy Unknown, and it ran nicely. Although it states 256M vram, the vram is actually 512M with 256M accessible by cpu, although i belive with apu's the vram is actually an allocation of system memory. unfortunatley the laptop has shipped with terrible firmware / DSDT tables, I had tweeked and compiled into the kernel, however the latest bios update (2016-04-14) includes these tweeks. The first stop for diagnosing / testing acpi issues is with command line options / boot paramiters passed to the kernel which instruct the kernel to load / not load certain acpi modules. At first I had installed without uefi, using acpi=off the laptop performed perfectly, however graphic were slow and the kernel was presented a single core. Jumpling up to acpi=ht most of the issues present with default boot were still present. reviewing the OSI, there were a number of forums online where there were suggestions for acpi_osi=linux, however reading the documentation, this is not a great help. * Linux responded TRUE upon a BIOS OSI(Linux) query. * an un-bounded number of BIOS incompatibilities. * could not do a speedy restore in its native driver. * POST -- putting Linux at a permanent performance disadvantage. * BIOS issues such as skipped device initialization. * OSI string, and from Linux-2.6.23 onward we respond FALSE. * BIOS writers should NOT query _OSI(Linux) on future systems. * Linux will complain on the console when it sees it, and return FALSE. * or boot with "acpi_osi=Linux"
You'll not only want the DSDT but the SSDT also... (when compiling you'll see the correct field data types and slightly differnt results regarding error output). This shouldn't cause any issues when using a custom dsdt, but it's nice to get the full picture. 1. Missing function for the default backlight, this function sets the default backlight level to 30, on this machine the max is 255 (/sys/class/backlight/amdgpu_bl0/max_brightness). I had thought the latest BIOS update introduced this method, but it hasn't. When you take subsequent DSDT dumps, it will include functions from an override DSDT. * Sanity check the reference count, for debug purposes only. 4. acpi bug: "WLVD Namespace"
5. acpi bug: "_SB_.RTC_.RTCW Namespace"
If you've disabled acpi or disabled the ssdts then the brighness buttons won't work. As a work around you can edit the brightness via the pci device in sysfs, this could be scripted. The brightness buttons trigger the DSDT methods "_Q11" and "_Q12", Q11 will notify VGA.LCD with 0x87 (ACPI_VIDEO_NOTIFY_DEC_BRIGHTNESS), and the Q12 method will notify VGA.LCD with 0x86 (ACPI_VIDEO_NOTIFY_INC_BRIGHTNESS). These notifications should be handled by video.ko. Once the video kernel module has been loaded the directory "/sys/class/backlight/acpi_video0" should be present. The brightness levels used via acpi are defined in BCL, which in this DSDT contains 49 presets. to force the use of the kernel video driver you can use the kernel command line option "acpi_backlight=video". once the DSDT is clean, and the video module is loaded the volume buttons will work but you can also edit the acpi brightness manually. 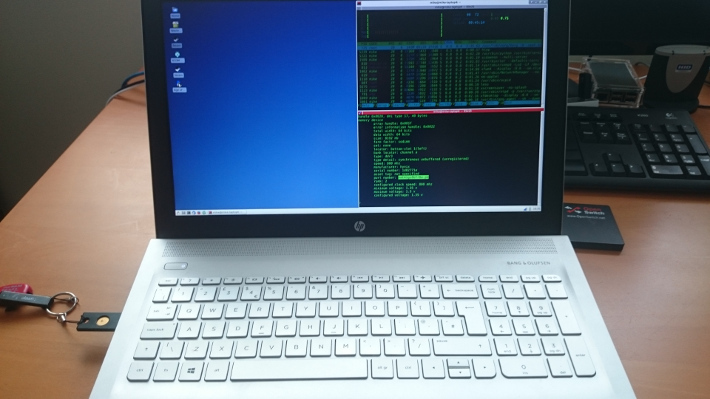 Debian does have packages for managing TPM, but for now, i've simpley hidden the device, making it availible caused issues when booting, the device can be hidden in the BIOS. I've now managed to get 100% succesful boot with hyperthreading and uefi, something i'd only achieved before with the legacy boot and acpi switched off. I've created a github repo which has a skel of the config files I'm using. (kernel config, kernel modules, module params, and a few other little bits). Note with the kernel boot time params, there is no need to tweek the firmware as a bunch of it is skipped. I've started working on a custom DSDT that will allow the tpm device to work. Seccond on the list will be enabling the various CPU frequencies, although I expect this is the SSDT causing most of this issues. current policy: frequency should be within 1.30 GHz and 1.80 GHz.